Open cans of biscuits onto a cutting board. With a sharp knife, slice biscuits in half to get 32 half-circles of dough. Press each biscuit half into a full circle. Stack 1 marshmallow and 1 peanut butter cup in the center of the dough circle and bring sides of the dough up to cover marshmallow and peanut butter cup, rolling and pinching dough as necessary to seal it into a ball. Repeat with remaining biscuit halves until you have 32 dough balls. In a large zip-top plastic food bag, add sugar and cinnamon and mix to combine. Divide dough balls in 2 groups. Add the first group of balls to the bag and close the top. Shake bag to coat balls in the cinnamon-sugar mixture. Remove dough balls from the bag and add the remaining dough balls to the bag to shake and coat in the sugar mixture. Add half of the sugared dough balls to a well-greased Bundt or angle-food pan. Drizzle with 1/4 cup of caramel sauce. Add remaining sugared dough balls and drizzle again with 1/4 cup caramel sauce. Bake at 350°F for 40 to 45 minutes. Remove from oven and invert immediately onto a large serving platter. 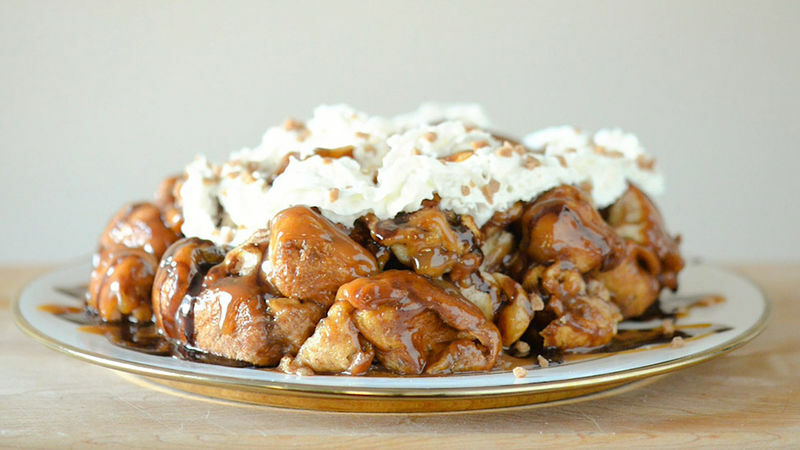 Drizzle with more caramel and chocolate sauce, then top with whipped cream and a sprinkling of toffee bits. Serve immediately!